Advanced design means more pages with less cartridge changes. Cartridge installs quickly and cleanly. 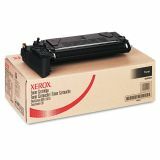 Xerox 106R01047 Toner, 8000 Page-Yield, Black - Toner cartridge is designed for use with Xerox 2118, CopyCentre C20 Digital Copier and WorkCentre M20/M20i. Yields 8,000 pages.